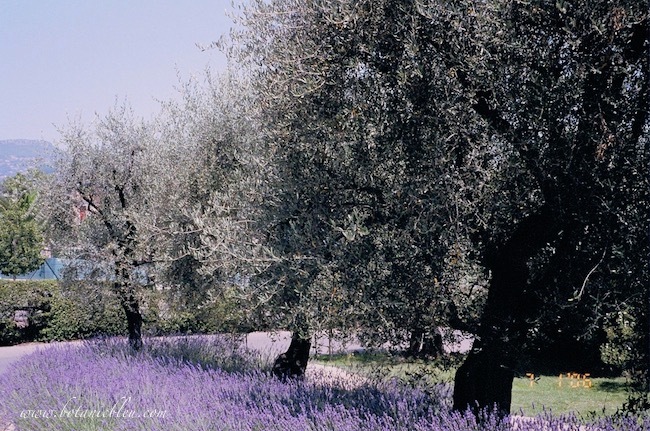 French lavender fields were on my travel wish list for years, and now are on my list of places to revisit. Seeing real lavender growing in France was an extraordinary girl's trip with my sister and good friend from work. Somehow our husbands were not as interested in spending days in French lavender fields as we were. Back home in Texas I try every year to grow French lavender, but only have marginal success. The plants grow and bloom in late March to May, then fade away in the Texas summer heat, and die over the winter. Except this one lavender plant last winter. 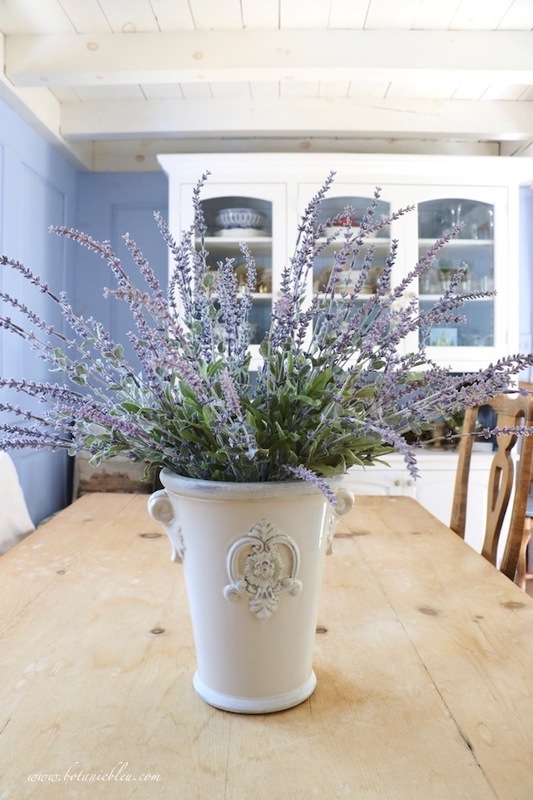 Read about French Lavender in Winter. 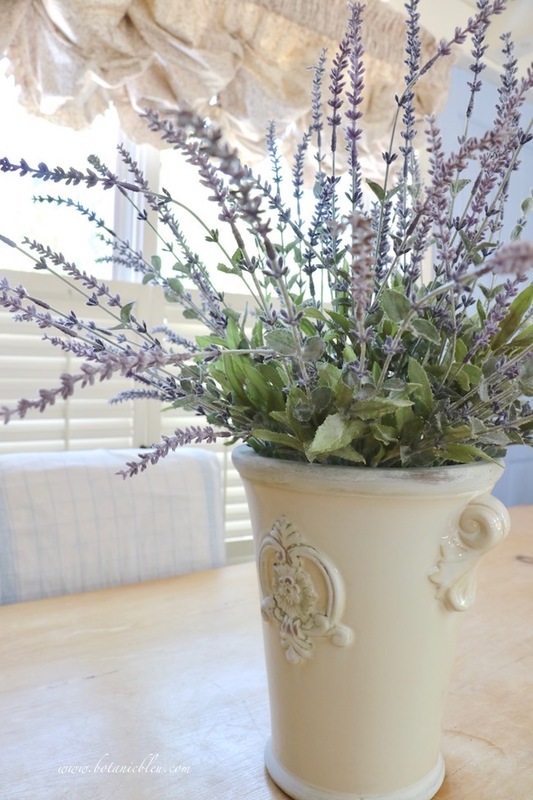 When I found a realistic spray of faux lavender this spring, I bought several stems to fill one of my favorite French style ceramic containers. 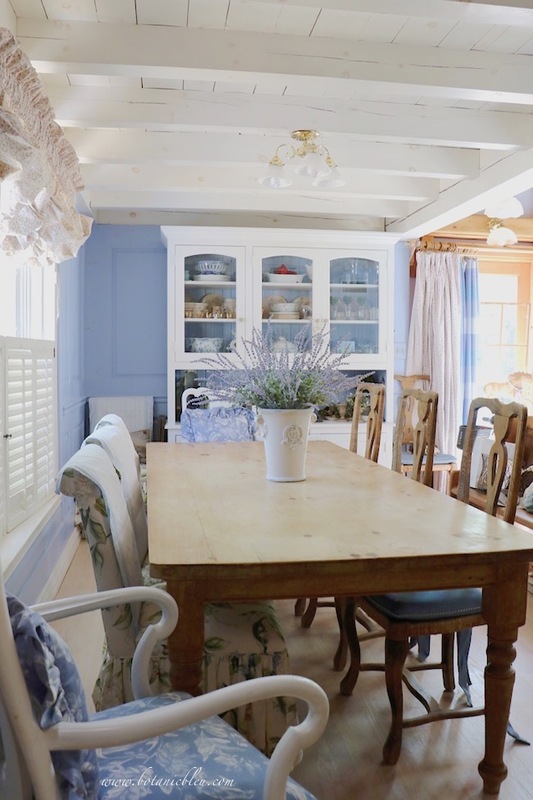 The purple flowers go well with the periwinkle blue wood paneled walls in the dining area, and the French style fits the country style I love the most. The flowers look so realistic and remind me of the trip to the lavender fields in the Provence region of France. In Provence, France, lavender blooms in late June and July in home and business gardens as well as in commercial lavender fields. The artificial stems I bought have green leaves at the base with long bloom stalks arranged to flair out like a real lavender plant. No watering is needed to keep this bouquet beautiful on my dining table. 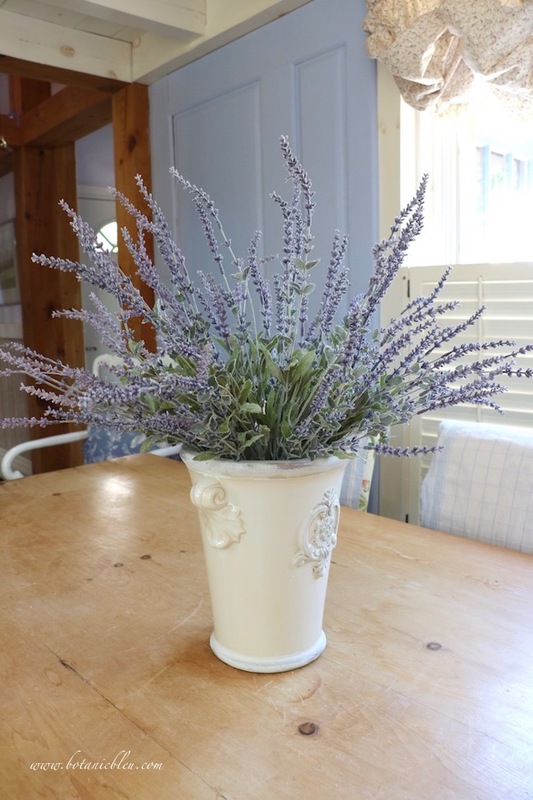 The large French style ceramic container filled with the faux lavender is perfect for Spring and all Summer on my dining table. 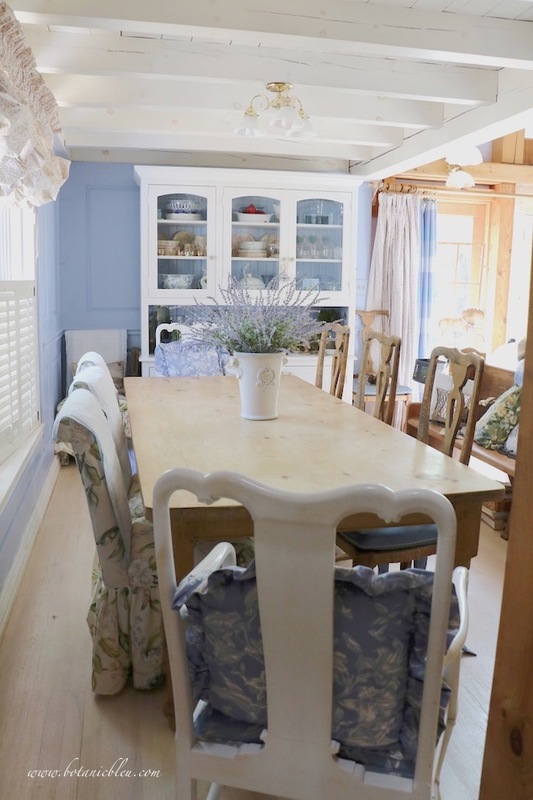 Lavender looks good with white, natural wood, blue, mauve, yellow, green... The plant goes with several decorating styles, cottage, American country, French country, shabby chic, traditional, coastal. Plus, the arrangement will look good all over the house... on the kitchen island, on the pine chest, on the flower stand in the entry, in the breakfast sunspace on the plate stand, on the back porch, and in the French market basket... Don't be surprised to see it in the background in future posts. Take a look at the arrangement in the garden shed. I plan to keep trying to grow real French lavender outside, but will also enjoy the faux lavender inside. 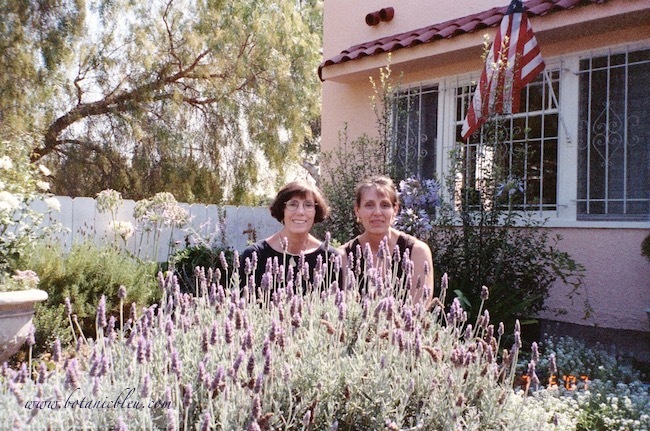 If only I could get lavender to grow in my Texas yard like it grew in my sister's southern California garden. She grew Spanish lavender. I am on the left in glasses, and my sister is on the right, several years ago at her house. Do you grow lavender in your yard? If so, what variety? Do you buy your plants locally or through an online source? Here in Alberta, I've grown different varieties of lavender, including Spanish. This year, I'm trying Monstead from seeds. Fingers crossed it grows well in a varied climate! I do grow lavender here in NC. I have several varieties growing. They do over winter here. I buy them locally. Some of the varieties were more successful this year. I am learning what works at my new home. Love your vase. I am going to have to get me some lavender totally thought they were real. Found you on Happiness is Homemade Link Party. Welcome! 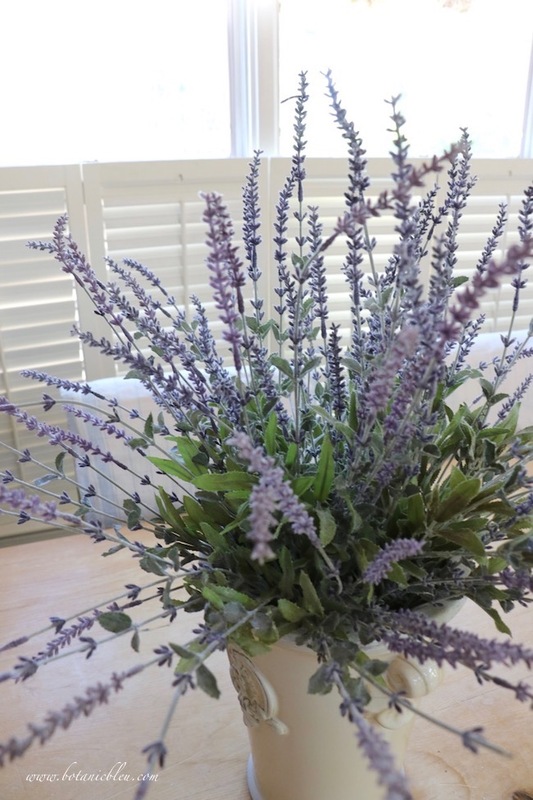 Aren't these artificial lavender stems amazing? I hope you can find some. Linky parties have always been one of my main ways of discovering new blogs and new friends. Looking forward to reading your blog. 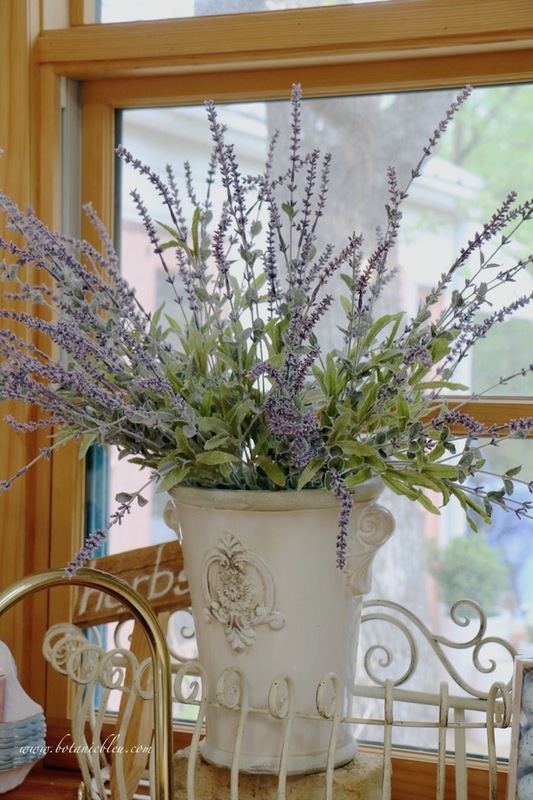 Your faux lavender looks so pretty arranged in your container and sitting on your table. Growing real lavender is not something I have ever tried. We have a local lavender farm in the community that I can get fresh lavender from. It makes the room smell so good! I may have to give growing my own a try. Thanks for joining us and sharing at Homestyle Gathering. We hope you'll come join us again. Judith, it's gorgeous and perfect for your home. It looks so real! You have such a pretty dining room. Judith, that is a perfect arrangement, and your dining room is just lovely! It's wonderful to have you at Homestyle Gathering! I'm letting you know that your lavender arrangement is one of my features this week over at Homestyle Gathering. Thank you so much for joining us and sharing. We hope you'll join us again. I am honored to be one of the features at Homestyle Gathering this week! Thank you for the honor and for hosting a linky party each week. Your party is now on my sidebar links to linky parties, and I look forward to joining again. I think it must be the drier climate in So Cal and the type of clay soil. Lavender loves crappy soil, which is odd. If I forgot about my Spanish lavender plants then they did great. When I would overwater or feed them, not so good. I do miss growing lavender and our California gardens but am enjoying creating a new garden here in Texas.